Kyabgon Phakchok Rinpoche is an enthusiastic and vibrant young lama–his teachings are direct, accessible, and always fresh, opening our minds in a playful and inspiring way. Rinpoche will be at Rigzdin Ling offering teachings and empowerment for two days in late January. In this beautifully concise Mahayana sutra, that is merely a page long, Buddha Shakyamuni summarized the five indispensible key points that every Bodhisattva must cultivate and master before they pass beyond sorrow. These five points–impermanence, great compassion, freedom from reference points, non-existence, and Buddhahood–are universally applicable to any Buddhists on the sutra path of Mahayana and the tantric path of Vajrayana. In Tibetan Buddhism the Vajrasattva root tantra is called Dorje Gyan, or ‘Vajra Ornament’. Vajrasattva practices are common to all of the four schools of Tibetan Buddhism and are used both to purify obscurations so that the Vajrayana student can progress through the preliminary purification practices through the stages of the path, and ultimately to a state of sublime buddhahood. Vajrasattva enables purification of any broken commitments and downfalls in terms of teachers, empowerments and teachings, and the sangha. Phakchok Rinpoche is the Supreme Head of the Taklung Kagyu lineage, the Abbot of a monastery in Chapagaon in the southern Kathmandu Valley, and the Head of Riwoche Monastery in Tibet’s Dokham region. Born in 1981 to Chokling Rinpoche and his wife Dechen Paldron, Phakchok Rinpoche is grandson of Tulku Ugyen Rinpoche and the eldest brother of the Yangsi Dilgo Khyentse Rinpoche. Recognized by the Kagyu regents and ordained by His Holiness the Dalai Lama, he has studied with a number of great lamas, including Khyentse Rinpoche, Dudjom Rinpoche, Tulku Ugyen Rinpoche, Penor Rinpoche, Trulshik Rinpoche and Nyoshul Khen Rinpoche. 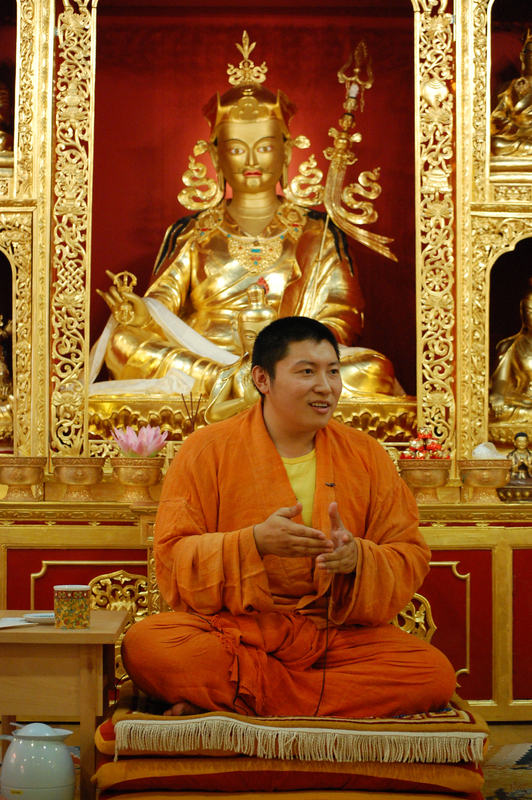 An enthusiastic and vibrant young lama, his teachings are direct, accessible, and always fresh, opening our minds in a playful and inspiring way. The Chagdud Gonpa Spiritual Directorate would like to thank Jigme Tromge Rinpoche for his foresight and devoted efforts at inviting His Holiness, Sakya Tridzin to Padmasambhava Peace Institute in order to bestow the most sacred treasures of Apong Terton. The Red Tara meditation practice of that cycle holds together all of our Chagdud Gonpa sanghas, and made this confluence of His Holiness and Chagdud Gonpa a truly historic and deeply meaningful moment in time with far-reaching benefits, not only for our sangha, but for all beings everywhere. Being in the midst of so many of Chagdud Rinpoche’s disciples and sanghas, to say nothing of receiving these blessing along with Dzongsar Khyentse Rinpoche and Jigme Khyentse Rinpoche, added to its preciousness and enduring inspiration. Our enthusiastic thanks to Jigme Tromge Rinpoche and his devoted sangha for creating this opportunity. Furthermore, we are truly grateful to Jigme Rinpoche for his continual vision and efforts in maintaining the strength and integrity of Chagdud Rinpoche’s lineage of practice and teachings, not only at his seat at PPI, but at all the Chagdud Gonpa Centers and Practice Groups that he has visited over the years. As well, he is maintaining the integrity of our connections with our lineage holders and sanghas in India, Nepal and Tibet. Jigme Rinpoche has put his whole heart and loving energy into preserving and enriching the lineage of Chagdud Rinpoche, serving the sanghas of Chagdud Gonpa with empowerments, teachings, and his insightful personal advice. Again, our gratitude goes out to Rinpoche with our aspirations for his long-life and the unhindered flourishing of his dharma activity. Whoever sees a stupa, or hears the wind blowing around it, or touches it, or remembers it establishes interdependence with enlightened mind. It is a sacred presence that radiates peace, harmony and healing throughout the world. Those who help to create a stupa plant the seed of their own enlightenment. Join us! Contribute to our matching fund. Join us in meeting our goal to raise $7,000 for the Stupa Restoration and Spiritual Park Project. When we’ve met this challenge the Project will have a grand total of $14,000. To watch a slide show of photos of our recent work on the Project and to learn more see blogchagdud.org. How to offer. To make a donation using a credit card, please call Rigdzin Ling at 530-623-2714. If you prefer to make your offering by check, please make the check out to ‘Chagdud Gonpa Foundation’ and mail it to P.O. Box 279, Junction City, CA 96048. Attached is a Donation Form for you to print and mail with your check, if you wish. Please indicate ‘Stupas and Spiritual Park’ on your check or when you make your credit card donation. Join us! Participate as a volunteer and/or support a volunteer in the Stupa Restoration and Spiritual Park Project at Rigdzin Ling. Join us from September 2 to October 2 for Arts Month at Rigdzin Ling and at any other time. Join us in re-painting the stupas, making clay tsatsas for the Tsatsa House, putting up new prayer flags, carving new roof ornaments for the Prayer Wheel and Tsatsa Houses. Join us by supporting a volunteer. To join us and reserve a place at Rigdzin Ling please call 530-623-2714 extension 126, or e-mail Timothy at info@chagdudgonpa.org. For questions or comments concerning the Project and if you would like to participate please contact Prema, project coordinator, at 530-623-4479 or premajanes@gmail.com. Due to the great generosity of a sangha member, we have been promised $7,000 when we meet the challenge to raise $7,000. This means that the project will then have a total of $14,000. This is a fabulous opportunity to make your donation twice as effective. I wish to make a donation in the amount of $________. Please make your check out to: Chagdud Gonpa Foundation and indicate ‘stupas and spiritual park’ on your check. Mail your check to: Chagdud Gonpa Foundation, Rigdzin Ling,P.O. Box 279, Junction City, CA 96048. In the next six weeks Rigdzin Ling will be graced by the presence of three knowledgeable and inspiring female teachers. On Saturday, July 23th, Lama Trinley, a resident lama of Dechen Ling in Cottage Grove, Oregon, will offer a one-day teaching on the relation of dharma and family life. From Saturday, August 14th, through Sunday, August 28th, Lama Sherab, a resident lama at Khadro Ling in southern Brazil, will lead a retreat in shamatha meditation. On the following weekend, Saturday, September 3rd through Labor Day Monday, September 5th, Lama Tsering will lead a Red Tara ceremony. It is said that all manifestations of feminine wisdom are aspects of Tara, and each of these three lady lamas certainly expresses Tara’s wisdom in a special way. Lama Trinley is the mother of two teenage boys, a cancer survivor, and is a long-time practitioner respected for maintaining view and meditation in her mundane activities. Although she does not specifically teach Great Perfection and her words are always modest, her way of being is a teaching. She is a talented writer and a poetic observer. Lama Sherab is a living proof that if our faith in the sacred sources of refuge is deep and strong, we will certainly find our teacher no matter how remote the place of our birth. 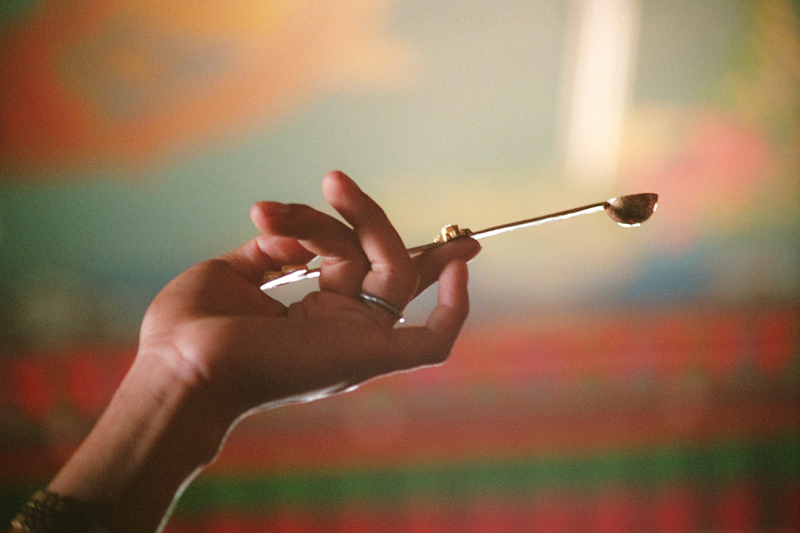 Born in the state of Amapá in the extreme north of Brazil–perhaps the only Brazilian in the sangha from that remote place–she met Chagdud Rinpoche and immediately connected to him as her teacher. Setting aside a career as a dentist, she served him constantly as a translator and assistant for eight years, until his death. Since then she has continued to serve, as a teacher, as a resident lama of Khadro Ling, and more recently, as the mentor of a young girl who Dzongsar Khyentse Rinpoche brought from the Amazon with the intention that she be trained. Lama Sherab without hesitation re-organized her activities to tutor the girl in both schoolwork and the dharma. Thorough in her study and practice of dharma, Lama Sherab has deeply integrated the shamatha methods of the Tromge Chenrazig cycle. Although the retreat require a traditional structure and a two-week duration, if we consider how many hours we meditate with wandering minds, how many deity practices we do without visualization–and perhaps how many lifetimes we have been practicing without full accomplishment–the two weeks invested in the retreat is obviously worthwhile! In January, Lama Sherab lead such a retreat for one month at Khadro Ling, and many of the participants had a moment of brilliant clarity when their visualization actually unfolded. As a third aspect of Tara, Lama Tsering Everest exemplifies Tara’s qualities of speech with her articulate, generous flow of teachings, her unusual turns of phrase, and her memorable examples. Chagdud Rinpoche saw her as the manifestation of a very old nun he encountered as he was leaving Tibet. “I’ll see you in the West!” the nun exclaimed. Afterwards Rinpoche wondered if the nun was a real person or a vision, but when he met Tsering in 1980, he knew that she was the fulfillment of the prophecy. 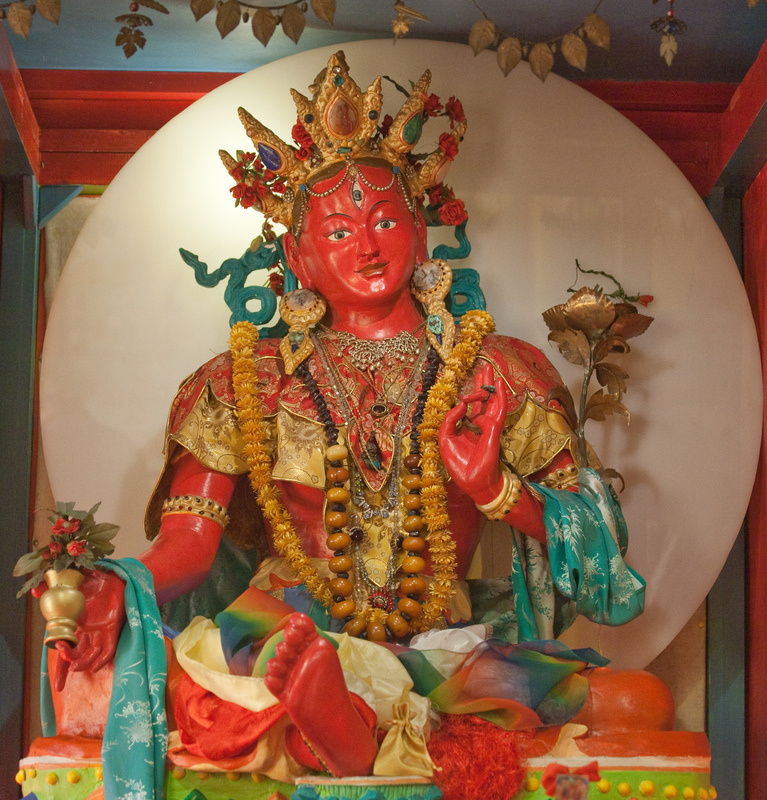 The Red Tara ceremony she will lead on Labor Day Weekend is especially auspicious because a lovely, life-sized Tara statue that she purchased years ago for Chagdud Gonpa has come to reside at Rigdzin Ling and to grace the recently remodeled shrine room. Red Tara is at the very heart of the Chagdud Gonpa sangha, a subtle force of compassion and wisdom that pulsates through our lives and refines them. As Rigdzin Ling opens wide its doors, it is hoped that many of you will come through them.